Beloved sister and sister-in-law of Louise and Oded Klinghoffer. Funeral services will be held Sunday, September 10, 2017 at Benjamin's Park Memorial Chapel (2401 Steeles Avenue West. Shiva in Toronto: Sunday -Wednesday at 14 McRoberts Place, Aurora from 2-4:00 pm and 7-9:00pm with evening services at 7:15pm. David & Zohar Levy on the birth of their daughter, Beatrice Frank Levy. When kindling Shabbat candles this evening, the OU has requested that we extend our prayers to all those in harms way, including the residents of southeastern United States and those struck by recent storms. Please join Jews worldwide by adding Psalm 20 at the conclusion of the blessing on the kindling of Shabbat candles (see text below). In recent days, countless individuals have manifest extraordinary love and care for God's children. May the Almighty reciprocate with Divine love and protection. May the Lord answer you when you are in distress, may the name of the God of Jacob protect you. May he send you help from the sanctuary and grant you support from Zion. May he remember all your sacrifices and accept your offerings. May he give you the desire of your heart and make all your plans succeed. May we shout for joy over your victory and lift up our banners in the name of our God. May the Lord grant all your requests. Now this I know: The Lord gives victory to his anointed. He answers him from his heavenly sanctuary with the victorious power of his right hand. Some trust in chariots and some in horses, but we trust in the name of the Lord our God. They are brought to their knees and fall, but we rise up and stand firm. Lord, give victory to the king! Answer us when we c all! א) לַמְנַצֵּחַ מִזְמוֹר לְדָוִד. (ב) יַעַנְךָ יְהוָה בְּיוֹם צָרָה יְשַׂגֶּבְךָ שֵׁם אֱלֹהֵי יַעֲקֹב. (ג) יִשְׁלַח עֶזְרְךָ מִקֹּדֶשׁ וּמִצִּיּוֹן יִסְעָדֶךָּ. (ד) יִזְכֹּר כָּל מִנְחֹתֶךָ וְעוֹלָתְךָ יְדַשְּׁנֶה סֶלָה. (ה) יִתֶּן לְךָ כִלְבָבֶךָ וְכָל עֲצָתְךָ יְמַלֵּא. (ו) נְרַנְּנָה בִּישׁוּעָתֶךָ וּבְשֵׁם אֱלֹהֵינוּ נִדְגֹּל יְמַלֵּא יְהוָה כָּל מִשְׁאֲלוֹתֶיךָ. (ז) עַתָּה יָדַעְתִּי כִּי הוֹשִׁיעַ יְהוָה מְשִׁיחוֹ יַעֲנֵהוּ מִשְּׁמֵי קָדְשׁוֹ בִּגְבֻרוֹת יֵשַׁע יְמִינוֹ. (ח) אֵלֶּה בָרֶכֶב וְאֵלֶּה בַסּוּסִים וַאֲנַחְנוּ בְּשֵׁם יְהוָה אֱלֹהֵינוּ נַזְכִּיר. (ט) הֵמָּה כָּרְעוּ וְנָפָלוּ וַאֲנַחְנוּ קַּמְנוּ וַנִּתְעוֹדָד. (י) יְהוָה הוֹשִׁיעָה הַמֶּלֶךְ יַעֲנֵנוּ בְיוֹם קָרְאֵנוּ. Monuments have dominated many recent news cycles. In truth, many iconic monuments define the values of a culture - from the Lincoln Memorial to the Great Sphinx. The Jewish nation is instructed to construct a monument upon entering the Land that will define the character of the new state. Massive tablets were to be erected, inscribed with the entire Torah in seventy languages. Once erected, the words were to be concealed with plaster (See Devarim 27:3-5, Rashi ad loc). The question is obvious: if these words were inscribed for all to read, why were they then obscured? Would anyone think to plaster over the inscription on the Liberty Bell to preserve its pristine condition? Perhaps our tradition is imparting a critical message. What's written on the surface has no great significance. The essence of Torah must be internalized. In fact, surface observance devoid of depth experience can pervert the intention entirely. Torah Law is intended to transform the inner core of our being. The true inscription is hidden to the naked eye. Our challenge is to crack beneath the plaster. Start of the Year Right! Experience an authentic, traditional Rosh Hashanah dinner with your Adas family! Featuring all of the special holiday foods & a warm, friendly family atmosphere. RSVP Required. Click here to reserve. Adas Israel's Hebrew School & Enrichment program for children of all backgrounds! Hebrew Language , Jewish Living, Weekly Torah Portion, Weekly Creative Art Projects with integrated Jewish themes. Click here to for more info or to register . 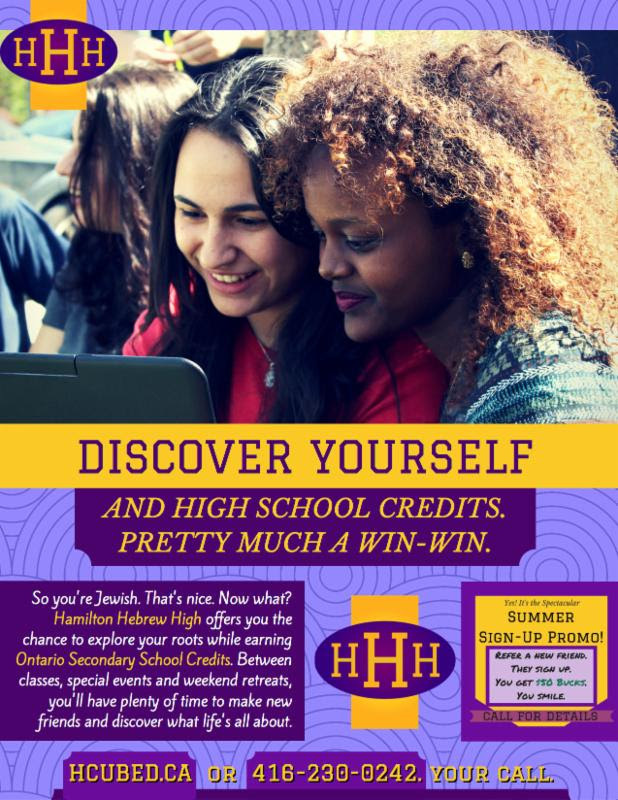 Hamilton Hebrew High offers you the chance to explore your roots while earning Ontario Secondary School Credits. Call 416-230-0242 or visit our website for more info. Join our dynamic family & children's services & programmes for the High Holidays. Youth Minyan (gr. 3-8) , Fun & Games, Kid's Kiddush & Prizes, Child Care.